Perhaps the cable wasn’t rated for outdoor use? The earth ground conductor isn’t insulated and the nonconductive filler strands look scary, but neither should kill you outright. As far as I can tell, the insulation around the individual conductors remains intact, but it’s surely brittle and ready to fall off at the slightest touch. The breaker box and cable are out of reach and, I suppose, out of mind. This entry was posted on 2018-04-07, 07:54 and is filed under Electronics Workbench, Oddities. You can follow any responses to this entry through RSS 2.0. Both comments and pings are currently closed. The long term effect of MIdwestern weather on electrical components is the main reason why I have no fear of a robot apocalypse. That bit of cabling probably gets direct sun in the summer (I’d guess that the part near the top where the cable is less ravelled is where the shadow of the room generally falls) ice buildup in the winter, and rain the time. Dealing with exterior, rooftop mounted parking lot lights on a regular basis, I am convinced that ten years is about the outside lifespan of any conduit left exposed to the elements. Got it in one: the box hangs on the south end of an east-facing wall, with the loop sticking out from the overhang. One of these days it’ll go pop and we’ll hear sirens Dopplering down at the intersection. That’s the main reason why the power lines on our place are underground. 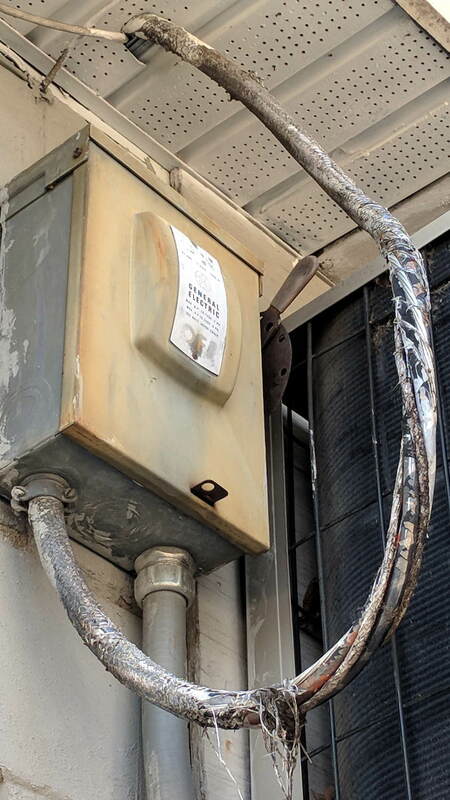 The 12.5kV to 220 V transformer is about 300′ from the meter, and plastic conduit holds up really well. Similar thinking for the run to the pumphouse; 350 feet worth of #4 wire should last a long time in a trench. I’m going through the code requirements for a PV system for the same pumphouse. The ground mount has to be designed by a structural PE, and I have someone doing that. The run to the pumphouse is fairly straightforward (metal conduit in spots so I can avoid an arc fault interrupter), but the inter-panel hookup needs research. At least most of it should be in shade.